This morning at the hotel breakfast the background music changed to the closing credits from Spirited Away. It was quite appropriate: The soundtrack had been running through my head during our stay there. This was, after all, a bath house as well as a hotel. Unazuki Onsen has a number of large hotels offering onsen baths. The Green Hotel Kisen is a bit further out than most but retains their slightly rundown exterior, as if it had seenuch better days. Perhaps it has, but the interior is still clean and well kept. Cypress wood is used extensively throughout and the large windows make the gorge scenery the real decoration. It felt like another time and place, faintly magical. I could almost imagine running into a radish spirit. Our breakfast was part buffet, part grilling fish and poaching egg at our table. Very Japanese for the most. After we returned from the Kurobe Gorge train and a lunch of noodles and curry the hotel shuttle bus drove us and our bags back to the Chiho Railway station. 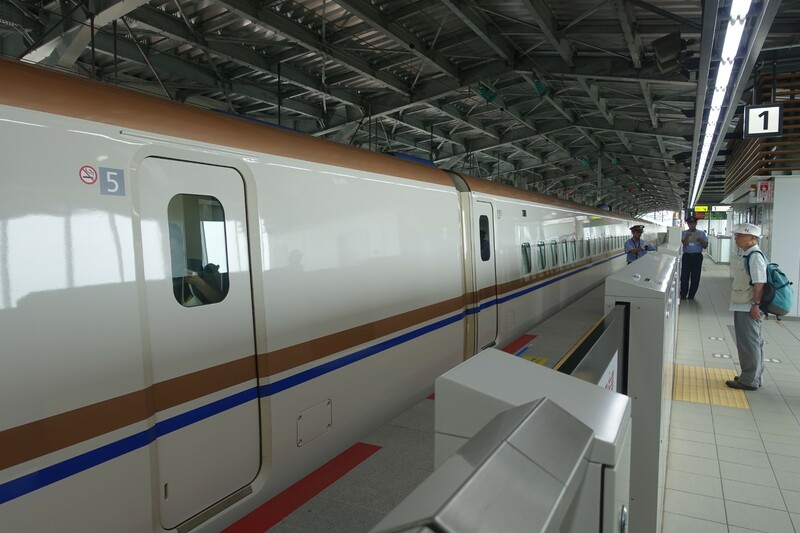 This time we only rode as far as Shin Kurobe Onsen station for a transfer to the Shinkansen. This is a new station in the middle of nowhere, but the adjacent tourist office has a really fascinating display on the nature and geology of the area. So now we are on the Hakutaka Shinkansen bound for Tokyo. Yes, backtracking. Time is running out to complete the compass.